Etoos India IIT JEE courses are developed with Kota’s experienced faculties. Students can boost IIT JEE preparations with crash courses, yearlong and complete courses. All Courses of etoosindia.com are focused and simplified for JEE Main & JEE advanced to bring to students an easy and analytical methodology towards physics, chemistry, and Mathematics. The courses clear the basic concepts in physics, chemistry and Mathematics and lay a strong foundation for the students aiming to appear for JEE Main and Advanced. To crack one of the toughest engineering examinations in the world, EtoosIndia with its team of talented faculties has designed comprehensive IIT-JEE engineering course materialfor all aspirants to amplify their performance. The subject experts with their vast knowledge and rich academic experience have rendered video lectures to help students master the subject with ease. Most of these faculties are IIT alumni who have a first-hand experience of giving the tough Joint Entrance Exam and are well aware of how to go about it to score well. IIT-JEE courses available for classes 11th to 13thare meticulously planned. These JEE courses have been categorized as yearlong, complete, first step, topic-based, final revision, crash course, and problem-solving depending on the requirements of students. The complete IIT-JEE course details & list can be obtained from EtoosIndia website easily. In this highly competitive environment, students generally start early with their JEE preparation. Those students can avail online IIT Foundation course which is formulated by our Kota’s best faculty. The prime objective of these courses is to lay a strong foundation for students of classes 9th and 10th. All the key topics in the foundation courses, as well as JEE courses, are explained in a student-friendly manner covering the Board & JEE syllabus simultaneously. The IIT JEE study material for both Main & Advanced is quite easy to comprehend. For the students who wish to gain a clear perspective on how online JEE video lectures work, EtoosIndia offers the facility of Free Trial before making any decision. The online coaching classes have also a dedicated platform for clearing queries of students known as 'Doubt Clinic'. If you have an apprehension of asking questions then you can do it easily with our Doubt Clinic. The faculty members are quick to respond to these queries. The video lectures are available in VOD, USB, mobile, tablet and laptop mode for both JEE Main and JEE Advanced. The facility of online test series to keep an update on the progress of preparation is also available. 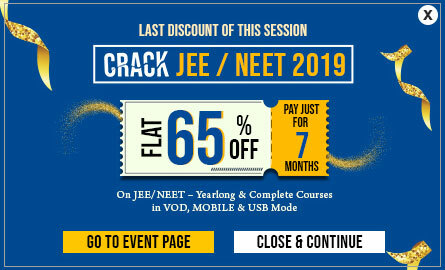 For the final of the preparation, don’t forget to take our smartly designed crash course for JEE Main and Advanced 2019. So if you have been wondering on how to study for IIT JEE, then EtoosIndia is the answer! We have been delivering excellent results over the years in the Joint Entrance Exam (JEE). With our online courses for IIT-JEE students are going to be well-versed & proficient with the subject topics for sure. All the best for the upcoming exam!